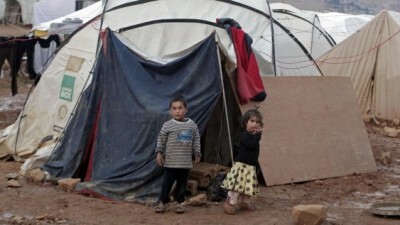 More than 1.7 million Syrian refugees in Jordan, Lebanon, Turkey, Iraq and Egypt are facing a disastrous and hungry winter after a funding crisis forced the UN’s World Food Programme to suspend food vouchers to hundreds of thousands forced into exile by the conflict. Since the war began in March 2011, the WFP has brought food to millions of Syrians inside the country, and has used the voucher programme – which allows refugees to buy food in local shops – to inject about $800m (£500m) into the economies of those countries hosting them. But after finding itself unable to secure the $64m it needs to support Syrian refugees in December, the WFP announced on Monday that it was halting the scheme. Severe funding shortfalls have already led the UN body to reduce rations within Syria, where it is trying to help 4.25 million people. Its executive director, Ertharin Cousin, issued a blunt and urgent appeal to donors, asking them to honour their commitments and warning that the suspension would have a devastating effect on the lives of more than 1.7 million people. She added that Syrian refugees in camps and informal settlements throughout the region were ill-prepared for another difficult winter, especially in Lebanon and Jordan where tents are drenched in mud, hygiene conditions are poor and many children lack shoes and warm clothes. Muhannad Hadi, WFP regional emergency coordinator for the Syria crisis, said the consequences for both Syrian refugees and host nations could be devastating. Greg Barrow, spokesman for the WFP’s London office, said the precise effects of the suspension would be hard to gauge because refugees’ circumstances varied from country to country. As many of the refugees were living outside camps, he said, there would be opportunities for them to look for informal work that would enable them to earn money for food. Others, in big camps such as Zaatari and Azraq in Jordan, are still receiving rations. Like many other international agencies, the organisation is having to contend with five simultaneous level-3 emergencies – the UN’s most serious crisis designation – in Syria, Iraq, South Sudan, Central African Republic and those west African countries caught up in the Ebola outbreak. Despite the competing demands, said Barrow, the WFP could not simply divert money from one crisis to another at will. The voucher scheme’s suspension comes nearly three months after the WFP first warned it was running out of money and weeks after it said it had reached a critical point in its efforts to help Syrian refugees because of a 89% funding shortfall. “For the next six months, the WFP requires $412.6m to support almost 3 million Syrian refugees in the neighbouring countries,” the UN body said in an operational resourcing update in November. Despite Monday’s announcement, the WFP said it would be able to resume the electronic voucher scheme immediately – if December’s funding were to come through in time. Syria’s three-and-a-half year civil war has killed more than 200,000 people, displaced 6.5 million within the country and forced more than 3 million to seek refuge beyond its borders. When the whole world is in ’emergency’ mode, we’ll really notice a population reduction … and the bombs and guns will still be purchased anyway. Good idea, we can also divert some of the Israeli free money for the cause as well. :)) it’s not free money, we Use it for research and the US gets to enjoy the fruits of our labor. and think about this man-o. I don’t mind cutting to zero our US help in condition the parasites cut their funding too..